With buyers spending more time self-educating and eluding sales conversations, B2B marketers need to step up their ability to target niche audiences, develop content that produces the desired prospect behavior, and help sales step into the conversation at the right time—without stopping purchasing momentum. The challenges and changes to the marketing landscape are huge, highlighting the need for new skill sets and processes that help marketers rise above the escalating noise caused by the new ease of content publishing. Your buyers have created the need for a content marketing continuum that provides what they need across their entire buying experience. This session will show you how to capitalize on this change. Business executives confirm that a majority of revenues come from existing customers – 68% according to a survey conducted by SAS and Loyalty 360. Yet most marketers spend the majority of their attention on net new customer acquisition. With contribution to revenues an increasing mandate from executive teams, marketers can benefit by engaging customers to drive cross and upsell. However, it’s not the same thing at all as marketing to brand new buyers. Putting high-strength retention programs into play will require a shift in marketing mindsets. How does your content position your company within your target markets? In this webinar, I’ll discuss why positioning is pivotal and how to find the distinct value that translates across all of your buyer personas. What we often forget in B2B is that there is a group of people making the decision. Your content must enable those conversations that go on behind closed doors as buyers work to reach consensus about change. Find out how positioning can be pivotal to making this happen. Today marketers can publish their content directly on major media sites, but is this the right content marketing investment for you? Join us for a discussion of today's most interesting native advertising opportunities for B2B content marketers. We will cover how to evaluate your options, the type of content you need to be successful, how it fits within your larger content marketing plans, how to measure your results and some alternatives you can also consider. Mark Schaefer’s post, Content Shock, stirred up marketers with people taking sides both pro and con. I think it’s a lot of hullabaloo and will show you why in this session. There is no silver bullet for marketing. I agree that there’s a “what’s next” for marketing, but it’s not without content. In fact, we’ve barely scratched the surface. In this webinar, I’ll present ideas about how to create sustainable content marketing programs and why jumping ship or discounting what’s possible is not in your best interest. Pipeline development is a constant need. Every business day, sales and marketing departments are tasked to acquire and qualify prospects actively seeking their product or service. Webinars and videos offer a proven technique of identifying a target audience that is self-educating on pressing business objectives. However, many companies fail to convert webinar engagement into exponential revenue growth. Join David Pitta and learn how a qualification team, powered by webinars and videos, creates hundreds of new opportunities worth millions of dollars every month. What makes a great marketing story? Join Ardath Albee, B2B Marketing Strategist as she discusses developing the right story for your brand and marketing collateral. B2B Marketers say they're struggling to produce enough content. But, what's the right amount? Is this even the right question? Many B2B marketers will tell you that they create compelling content their buyers actively consume. But, when you ask them about impact to pipeline momentum, not many can quantify the contribution of all that content. 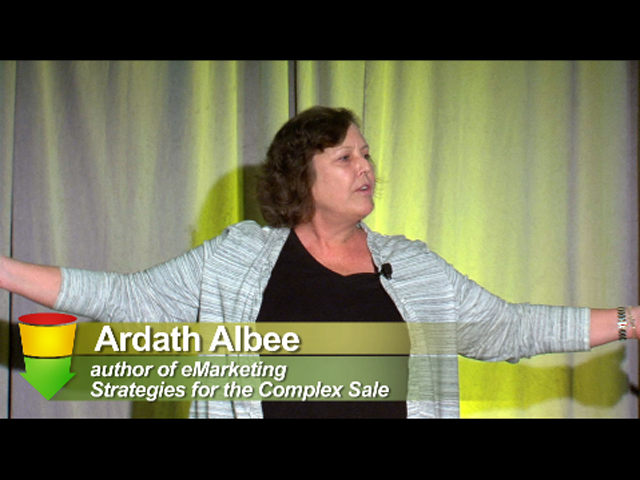 Ardath Albee, author of eMarketing Strategies for the Complex Sale, will show you how to put marketing content to work to produce better outcomes. In a “know your buyer” world, more B2B marketers are creating personas. But then what? Personas are often treated as a checklist item when they should be actively used as a tool that plays a vital role for informing the relevance and engagement potential of your content strategy. In this session, Ardath Albee, author of eMarketing Strategies for the Complex Sale, will show you the components you need to create valid and usable personas and how to use personas to improve marketing program performance once you have them. Only 25% of buyers say they trust vendor content, stating that there’s still too much sales messaging. Your customers are clamoring for new ideas, insights to trends, and strategic partnerships with vendors who can help them develop a vision to drive future business growth. It’s time to play a more strategic role in your customers’ longer-term potential. In this session, Ardath Albee, CEO of her firm Marketing Interactions, will discuss what sets thought leadership apart from marketing content and show you how your company can develop and share innovative and progressive ideas that resonate with your target audience to establish credibility, trust, and loyalty. By proactively shaping your customers’ perception of your company’s expertise, marketers will play a more definitive role in expanding reach, growing market share and improving revenue performance. Ardath Albee, B2B Marketing Strategist, Marketing Interactions Inc.
As we begin a new year, we have big plans for our marketing strategies. In order to gain the most value from our digital marketing programs it’s important to make sure they are aligned to buyer needs and preferences. In this session, you’ll learn how content consumption and channel trends in B2B are changing and the shifts required to ensure your demand generation goals for 2013 are achieved. Ardath Albee, CEO, Marketing Interactions, Inc. Engagement is a buzzword often bandied about by marketers as the path to performance and lead qualification. But its meaning has become blurred, causing marketing efforts to miss the mark. In this session, Ardath Albee, CEO of Marketing Interactions will show you what engagement is and what it isn’t, along with the steps to take to develop the level of engagement needed to turn prospects into buyers—whether the channel in use is search, social or mobile. Did you know that buyers spend only 21% of their buying process in conversations with salespeople? With buying committees growing and “visible” sales cycles shrinking, the ability of marketers to engage anonymous website visitors, transition them into named-accounts, and enable salespeople to productively pursue deals is critical for improving revenue performance. B2B Marketing Strategist Ardath Albee shares insights and expertise to help companies with complex sales design eMarketing strategies that use contagious content platforms to drive pipeline and revenues.